On board the Wilhelm Gustloff, each day brought a new speisekarten. 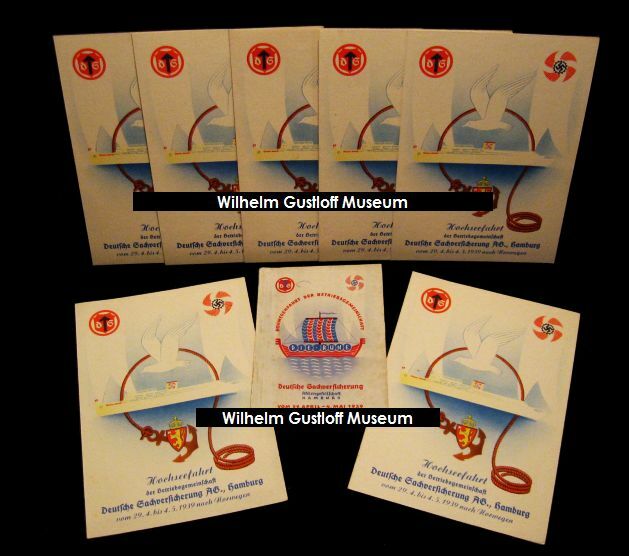 These were combination agendas / menus made onboard with the Gustloff's printing press. Each one measures 5" x 7.5" and shows the agenda on the left and the menu on the right. There are often items printed on the backs as well during special voyages. On the back covers of the first and last speisekarten for the voyage is usually a summary of the trip and destinations. On a few menus are features of the ship, songs to be sung, and other information for that trip. Photo galleries will offer close-ups of each cover and its contents for the menus in our collection. Dates Below: Saturday: March 11th, 1939 - Sunday: March 12th, 1939 - Monday: March 13th, 1939 - Tuesday: March 14th, 1939 - Wednesday: March 15th, 1939 - Thursday: March 16th, 1939 - Friday: March 17th, 1939 - Saturday: March 18th, 1939 - Sunday: March 19th, 1939 - Monday: March 20th, 1939 - Tuesday: March 21st, 1939 - Wednesday: March 22nd, 1939 - Thursday: March 23rd, 1939 - Friday: March 24th, 1939 - Saturday: March 25th, 1939 - Sunday: March 26th, 1939 - Monday: March 27th, 1939 - Tuesday: March 28th, 1939 - Wednesday: March 29th, 1939 - Thursday: March 30th, 1939. Voyage #42 - Business Trip of the Firm Bernward Leineweber of the Dockyards. Dates Below: Saturday, February 18th, 1939 - Sunday, February 19th, 1939 - Monday, February 20th, 1939 - Tuesday, February 21st, 1939 - Wednesday, February 22nd, 1939 - Thursday, February 23rd, 1939 - Friday, February 24th, 1939 - Saturday, February 25th, 1939. Recently added: Wednesday, February 15th, 1939 - Thursday, February 16th, 1939 - Friday, February 17th, 1939. Dates Below: Saturday, May 13th, 1939 - Sunday, May 14th, 1939 - Wednesday, May 17th, 1939 - Thursday, May 18th, 1939. Norwegian Cruise & Reichsjugendführung (Reich Youth Leadership) Cruise. According to the back cover of this voyage, the Youth Leadership Cruise was not a part of the planned voyage. The ship docked in Hamburg on the 15th and apparently this special part of the trip took place over the 15th and 16th, though nothing is mentioned. The three sets of photographs previously came from www.wilhelmgustloff.com. Dates Below: Saturday: April 29th, 1939, Sunday: April 30th, 1939, Monday: May 1st, 1939 (x2), Tuesday: May 2nd, 1939, Wednesday: May 3rd, 1939, Thursday: May 4th, 1939. Speisekarten for June 3rd, 1939 - June 9th, 1939.